Home > Outdoor Living > Garden Benches > Bench - If You Pause To Reflect..
We live in a busy time and often forget to pause and enjoy life, reflecting on all that makes our life meaningful. A wise person counts their blessings. Made of cast stone, this bench is weatherproof and has year-round durability. Sturdy support legs and weatherproof adhesive are included. Made in the USA. 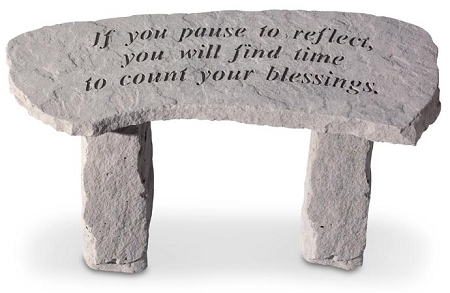 This bench makes a great centerpiece to any garden and gives a great message. Memorial Bench - If Love Could Have Saved You..